Atlantic Salmon very closely resemble Brown Trout. Atlantic salmon have a forked tail, a small mouth not extending past their eyes and their body scales are small. Their back is blue to silvery blue, to brownish olive. Their sides are silvery, their belly silvery white and they have small dark spots on the back and sides. All fish farms are licensed under relevant State legislation that controls farm operations even including water supply and discharge. 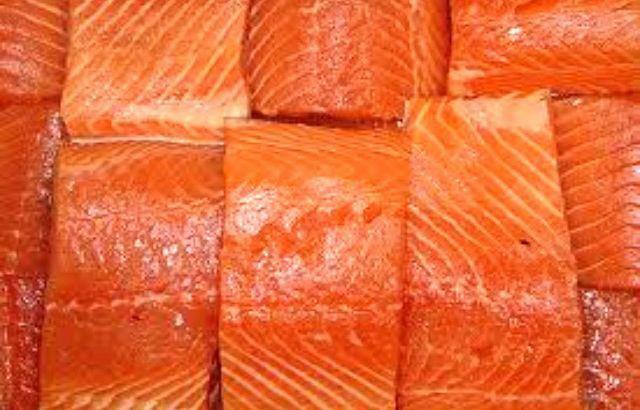 To maintain the DISEASE FREE status of Australian atlantic salmon products, there is a total ban on imports of salmon products, other than those canned or hot smoked. How do you tell an Atlantic Salmon from a Pacific Salmon? The key distinguishing feature of Atlantic salmon is black spots on the gill cover. Did You Know? Atlantic salmon belongs to the same family (Salmonidae) as the trouts. Atlantic Salmon very closely resemble Brown Trout. Atlantic salmon have a forked tail, a small mouth not extending past their eyes and their body scales are small. Their back is blue to silvery blue, to brownish olive. Their sides are silvery, their belly silvery white and they have small dark spots on the back and sides. Most fishermen flyfish for salmon, but spinning gear can also be used. Hootchies, bait, and coyote spoons in a three and a half or four inch size are popular. Nasty Boy, green-glow, green nickel, blue nickel and Cop Car coyote spoons are often a good choice to have in the tackle box. Green glow flashers and purple haze flashers are often a good choice when fishing with plastics, spoons, and bait. Atlantic Salmon - Flesh pink/orange colour, firm but good flaking texture. Salmon fillets are good for sashimi. Salmon steaks have small bones inside. Atlantic Salmon is sold whole or as cutlets or fillets. Excellent smoked or as sashimi. Smoked salmon paté is very good. Overall very good eating, although it can be dry if overcooked. High in Vitamin D. Recipes and cooking information. In Australia Atlantic Salmon are Farmed The Atlantic salmon was introduced into Australia in the 1960s, and local aquaculture now provides a year round supply. Product grown in Tasmania is considered among the worlds best. Atlantic salmon farmed in freshwater or brackish water tend to have gold-coloured skin, whereas those from saltwater are usually silvery blue. Atlantic Salmon commercial fishing data for Australia. Buyers and sellers of Atlantic Salmon companies and contacts listed. Interesting salmon facts, links about salmon fishing, Australian fisheries statistics, NSW Department of Primary Industries Fishing and Aquaculture Atlantic Salmon information.